Today, Annie Grace welcomes Danita, a 61-year-old who has a truly inspiring Naked Life story! At 61, Danita brings a perspective from one of the fastest-growing demographic groups of drinkers…..women over 50. Danita highlights the importance of the community of support and friendship she has found through This Naked Mind and calls them – ‘the best friends she’s never met’. I was raised by non-drinkers. So in a way, I felt like my alcohol car had no brakes. In high school, I didn’t experiment like most kids. I was more into donuts and fudgsicles. Anyway. But I did. I remember a cold once, and I guess my mom bought me some NyQuil. So I’m drinking the NyQuil and sleeping really great. I’m thinking, “Hey, this is pretty good stuff.” Although, it’s actually horrible stuff. I kept drinking, taking the NyQuil after I didn’t have a cold. I remember. And of course, it’s got a big percentage of alcohol in it. I don’t know. 10, maybe? I stepped off the school bus one day. And of course, I’d started drinking like, say, the cup and a half, instead of just the cup. I got really dizzy. And I thought, “Oh, I better quit drinking that.” So in a way I was smarter then. Later on, I had a boyfriend for a couple years, from 20 to 22. He told me he was an alcoholic, and I’m like, “Okay, what ever.” They say the first step to recovery is admitting it. Well, that was the first, last, and only step he was going to do. On the days he worked through the week, he’d drink beer. On the weekends, he’d carry around a little flask in his pocket. And I’m thinking, “What do you need that for?” Anyway, we broke up, which was really good. I got married at 23, I think it was. Had three kids in the 80s. During that time, I really didn’t drink at all. Even before that time, with the boyfriend, it was just social drinking and not bad. At one point, I had this little, almost alert in my head. “If you drink any more than this, you’re going to get sick.” And I’d slow down and stop. Eventually, you drink long enough, there is no alert anymore. Through the kids, when they were little … They were two years apart … I really didn’t drink at all, hardly. When I went back to work my youngest was 18 months old. I did a 3:00 to 11:00 shift. My husband was going to school on the VA. So it worked out perfect. We didn’t have babysitters. And one night after work, I went to a barhopping with these two girls. This is the first time I’ve drank in years and years. The smaller girl I was with, she thought she was pregnant, so she stayed clear of the alcohol. The other girl, I thought, “Well, I’m bigger than her. I’ll just match her drink for drink.” Well, she drank all the damn time. I didn’t know this. But, anyway. He got me to bed. I didn’t drink much at all then. When the kids were a little older, we had trouble. We separated. I had a friend. We had social drinking. It was still the honeymoon phase of the whole alcohol thing. So it was good times. I didn’t drink too much. My youngest son was terror teen. He was absolutely terror teen. He says, “I probably drove you to drink.” I said, “No, you didn’t.” I said, “I didn’t even drink that much then. I did a few social drinking with my friends. I never went to the extreme with that.” Because I really had to keep my wits about me for this kid. We couldn’t both be nuts. You know? People can push your buttons. They can make you want to drink. Ultimately, you’re the one that picks up the drink. You’re the one that’s harming your body and your mind. You can blame somebody else all that you want, but that was your decision to do it. I told him, “No, you are not at all to blame, at all.” And I said, “And for one thing, I didn’t really get started until I was like 50.” And at this point, I believe … You can probably tell me if this is true or not. I must have hit the two largest growing populations of the drinkers. The older drinker and the women. Me and my husband were empty nesters, and we’re like a couple of frat boys. Like I said, my family came. They were non-drinkers. My grandmother actually said once, “Lips that touch liquor will never touch mine.” Which had gotten an eye roll, of course. They were Baptists, and Baptists don’t drink. Well, unless it’s secret. Most of them, I guess. And I always thought, “For His first miracle, Jesus turns the water into wine.” So I single handedly went around to change this Baptist. That’s no fair to leave it to just the Catholics, Methodists, or whoever is doing it. I love being a Christian, but, yeah, this was not going to work. Turns out those Baptist are on to something, because I don’t care whether you are the most devout Christian in the world or an atheist, you drink enough, you’re going to violate your own moral code. So like I say, we’re still in the honeymoon phase from the 50 to 55 as an older drinker it ramped up slowly, having a grand old time with our little wine and his beer. Sometimes, he’d buy a big bottle of whiskey and stuff. It was really kind of happy. Now, I can now disassociate happiness from the alcohol. It’s the experiences, the people you’re with. That’s what makes you happy. Half the time, I can’t even remember stuff. So eventually, it got more and more. I really don’t like a lot of reality, and I’m a magic-pill person. If I could have had my little alcohol monster surgically removed, I’d done it in a minute. I wouldn’t have hesitated. I’d rather have major surgery than do anything, actually work. 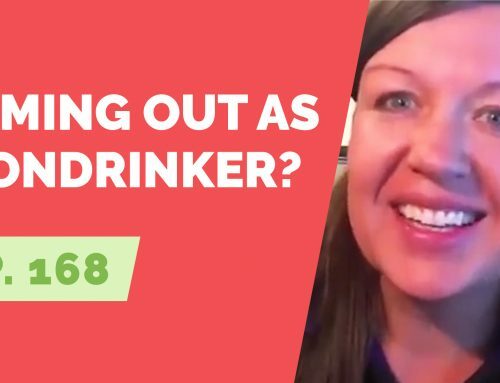 Tune in to the complete podcast to hear more about how Danita went from an older drinker to a non drinker with the help of This Naked Mind! If you’re an older drinker looking to stop – download the first 40 pages of This Naked Mind for free today to get started!